Pinecam.com • View topic - New Dog Training Center! Post subject: New Dog Training Center! Friends For Life Holistic Pet Training is very excited to announce our new DOG TRAINING CENTER!! We have a great space in Evergreen where we are gathering other trainers with amazing specialties to run fun classes for you and your dogs. We always dreamed of being able to offer not only amazing puppy classes, adult obedience classes, and behavioral issue assistance, but to really give owners a way to explore some of the fun things that are becoming popular to do with your dog. 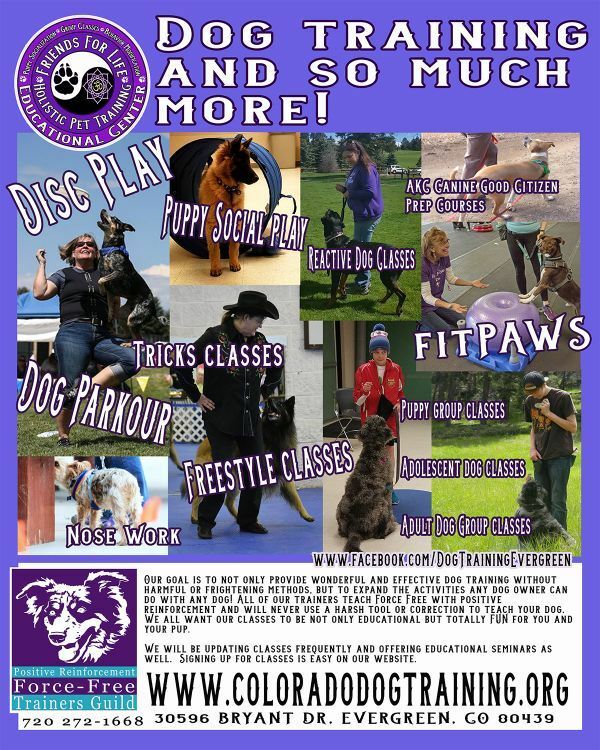 Right now we are starting with classes such as DISC, Tricks, Freestyle, Nose work, fitPaws, Parkour and MORE! We are going to have puppy classes as well as puppy social hours. And playgroups for big dogs as well as Tiny Ones! AKC Canine Good Citizen prep classes, as well as testing, will be offered. ALL TRAINERS ARE FORCE FREE, MODERN TRAINERS. No Shock, No Prong, No Fear! CHECK US OUT! Come on in and learn something FUN to do with your dog!